In February, I wrote a post about Farming - A Family Tradition. In the post I shared some of my family's farming history and legacy today. I enjoyed putting this post together and since originally posting, I have used the basis of the post for a presentation for civic groups this winter. 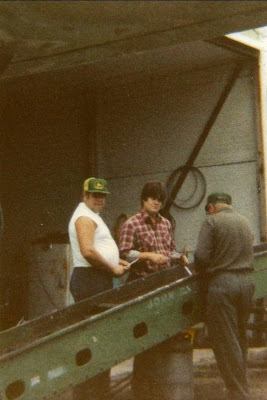 I bring this up because my Grandma just sent me a copy of a photo she took in the Summer of 1981 of My Great-Grandpa, Grandpa and Dad all working on the farm together. By presenting about my family's farming legacy and what the future holds at civic groups this winter, I have discovered how truly blessed I am to grow up and know my family. My Great-Grandpa and his brother helped on our farm for many years. My Great-Grandpa passed away when I was in elementary school, and his brother died when I was in junior-high. My Great-Grandma passed away my senior year in college. How many people get to have close relationships with members of their family three generations before them? My Farmer and I feel so proud of farming today and feel fortunate to be doing so. When our families started farming in the United States through just recently, farming was a means of family support. Today, farming has become a business. Even though this may be, My Farmer and I strive for farming to be more than a business for us, for it to be a way of life, just as it was for our elders.